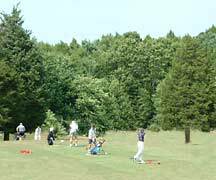 Our full length driving range features an all grass teeing area. $4.00 for a small bucket, $8.00 for a large bucket. Elmridge currently has two teaching pros on staff offering golf instruction at our range. Call the pro shop for more information about lessons. Driving Range is 225 yards long. $4.00 for a small bucket. $8.00 for a large bucket.